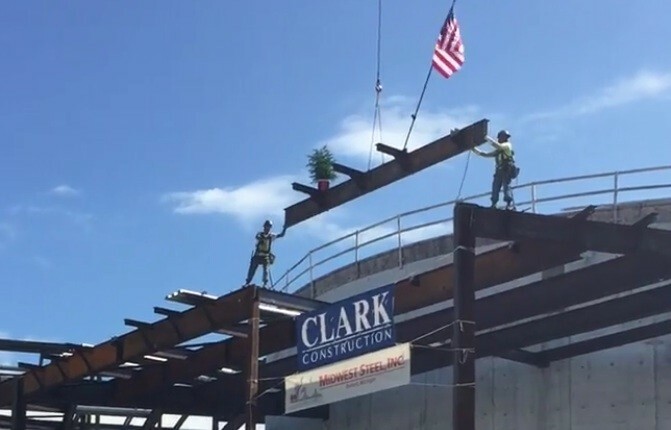 Construction activity at the Miami Beach Convention Center continues in full swing as the City crossed a major milestone. Now more than 50% complete, the new building is expected to be ready by next August. 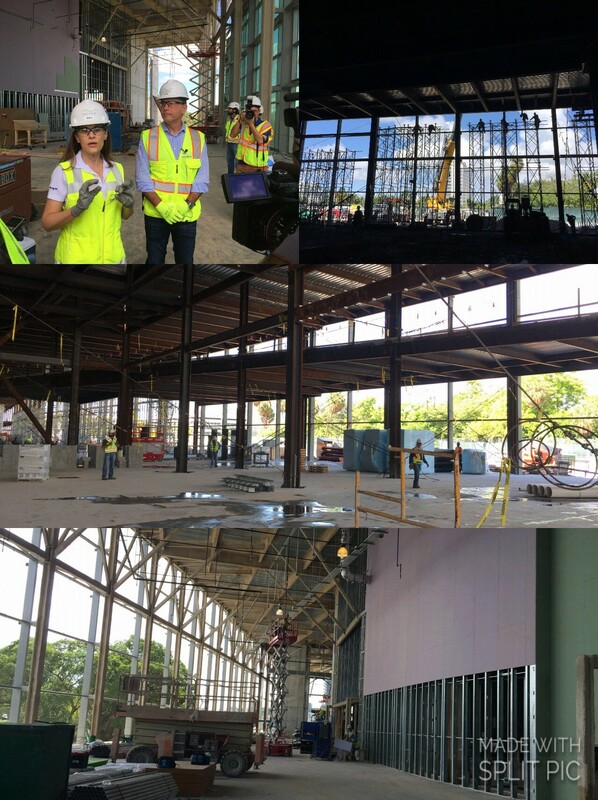 Mayor Philip Levine, Project Director Maria Hernandez, and Clark Construction executives took reporters on a tour this week to show off the progress on the $615 million renovation and expansion. The City is doing something unusual during construction, holding events intermittently. This year, for example, the eMERGE show and Major League Baseball’s FanFest were hosted in the almost complete east wing. And, in a nod to its importance to the City, the construction schedule was built around Art Basel’s annual schedule, making the needed four ballrooms and meeting space available each December. “That’s one of the unique parts of this project. We’re in business during construction,” said Hernandez. The Convention Center hosted 26 events in 2016 and will host 11 events this year and 14 in 2018, all around various stages of construction. The new 16-acre building is the length of three football fields. In addition to the expansion, it will be both resilient and environmentally friendly. Two stormwater pump stations have been installed which Hernandez said will eventually interconnect with two existing neighborhoods and floors in the Convention Center have been raised four inches to meet new FEMA flood standards. When completed, it will also meet all of the requirements to be designated LEED silver, a certification of the Green Building Council. The completed Convention Center will include nearly 500,000 sq. feet of exhibit space, a 60,000 sq. ft. grand ballroom, a 20,000 sq. ft. junior ballroom with glass rooftop, additional meeting rooms, and indoor/outdoor public spaces. The City is also restoring the oldest building in Miami Beach, the Carl Fisher Club House, which sits next to the Convention Center, to be used as event space. The first four-hall show to be held in the completed Convention Center will be the American Health Information Management Association in September 2018. Last week, Art Basel signed a contract to remain at the Convention Center for up to ten years after the City agreed to add an additional escalator/elevator during construction to connect the exhibit halls directly to the Grand Ballroom on the second floor. Design Miami is also considering a ten-year commitment to its location in the surface parking lot across from the Convention Center. That lot will be transformed into park space once the Convention Center construction is complete. Design Miami, which has run in conjunction with Art Basel since 2011, sets up two large tents as exhibit space on the western portion of the lot. 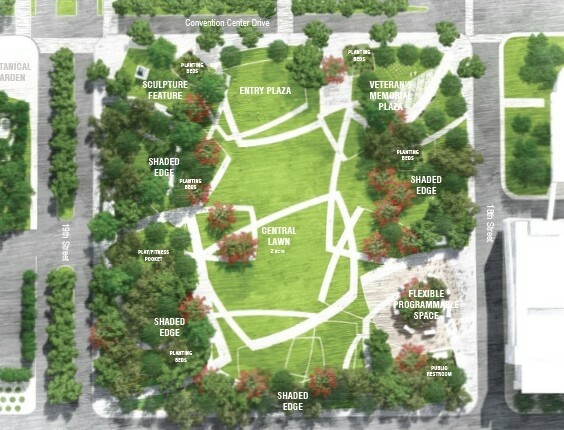 When discussions began on a long-term commitment, conceptual drawings of how Design Miami’s temporary exhibit space would fit into the new park created concern among residents that the City was reducing the number of trees planned for the area. At last month’s City Commission Meeting, Hernandez reassured Commissioners and the public that that is not the case. “I want the public to know, number one, we are not reducing the amount of trees in the design. The [original] design has a total of 168 trees … Of those trees, 80% are shade trees. And in the new design, we’re going to have exactly the same amount of trees.” She said the location of the trees will be different from the original design to accommodate the Design Miami exhibit space, but the number will remain the same. In fact, she said, “We are reducing the hardscape by at least 13%, maybe more, as we develop the design.” She said Design Miami has been willing to be flexible on the orientation of their tent space. Commissioners gave their go ahead for the design changes. The 10-year proposed agreement was referred to the Finance Committee for their consideration before coming back to the full Commission for approval. Update: A long-term agreement was approved in October.